The Pens won for the fourth time since the Olympic break, downing Boston 2-1 at the Igloo on Sunday. Unfortunately, the post-game chatter is concentrated on the blatantly dirty hit leveled by repeat offender Matt Cooke on the Bruins' Marc Savard, which put Savard on his back for 10 minutes and required the assistance of a stretcher for his exit. As per the current rules, no penalty was called on the play; but you can bet your bottom dollar that Cooke will be spending some time in a league-mandated time-out very soon. In case you've forgotten, this is not the first time this season that Cooke is under fire for his methods. Rangers forward Artem Anisimov sure hasn't. Other than the unfortunate Cooke-Savard incident, it was a hard-fought, entertaining game featuring quality efforts from both goalies. The red-hot Pascal Dupuis, who's scored three goals in the four games since the break, and Geno Malkin lit the lamp for the Pens, who got 21 saves from Marc-Andre Fleury in goal. And Alexei Ponikarovsky came through with an assist on Malkin's goal and continued his fast immigration into the team's system. It was a second comeback win in as many days for the Penguins, as Pittsburgh faced a 1-0 deficit well into the second period on Sunday. After 66 games, the Penguins currently sit second in the conference, behind our friend Alex Ovechkin and the Capitals. The Pens are off until Thursday, when they face the streaking Carolina Hurricanes, 7-3 in their last 10. Maybe Bill Cowher will grace us with a guest appearance at this one. How was that not at the least a penalty for elbowing? He elbowed him right in the face! If you watch the slo-mo later in the clip you see Cooke never raises his arm. Savard was bent over as he had just taken a shot toward the goal. Cooke guides across from Savard's blind side and as they say, catches him with his head down. I have seen Mike Richards of the Flyers lead with his forearms into Sidney and others WITHOUT getting penalized. His hits are more vicious and he has yet to be suspended for those. (Note: Richards WAS penalized for his hit on Booth of the Panthers, but was not suspended. I have yet to hear if Booth has returned to play.) Until Richards is suspended I will contend Cooke was within the rules and does not deserve a suspension. I do believe the league will suspend Cooke, though. The Cooke incident aside, I'm at least glad to see them getting some separation from New Jersey. Of course, it doesn't mean anything unless they, you know, actually BEAT them at some point this season. Don't forget. 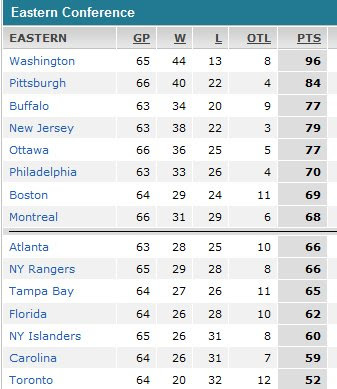 As of this writing, the Devils have 3 games in hand on the Pens. We have to root for whomever they play between now and Thursday to beat the Devils in regulation. At no time did he lead with his elbow. All shoulder. This isn't a penalty nor is it suspension worthy per the current rules. However because it is Matt Cooke, you can bet he'll have a few days off. Case in point the other night in New York right off a face off at center ice, Cooke went to the box along with Prust for Unsportsmanlike Conduct. The only thing Cooke did was take an elbow to the face before the puck was dropped. Have to wonder if/when they suspend him if they'll take the fact that we play Boston in two weeks into consideration in terms of length or when they start it. It's a blatant hit to the head. Regardless of what he hit him with or the way the rules are worded, I would expect anyone to get suspended. Not just because he's Matt Cooke. Imagine if it were Mike Richards putting the hit on Crosby, with 87 laid out on the ice and carried off on a stretcher--we'd be calling for 5-10 years in prison. I can;t imagine there would be too many people saying "well, it was a clean hit..."
I don't like the Cooke hit at all. No, he didn't elbow him but I do think he was certainly looking to take him out with a blindside hit. With that out of the way, the Mike Richards hit on Ballard was worse and there was no suspension for it. The reason is because this hit is technically legal. That is where the real issue lies. Cooke definitely knew what he was doing there, though. Well, I have to disagree. If somebody puts a hit to Sid like that and he is laid out on the ice, that player would receive a hero's welcome in every arena for the rest of his career. People would be saying " he was just finishing his check, playing to the whistle, and trying the alter the shot"
Don't underestimate how much people hate Sid. Ah, a good robust debate. Let us not forget that we Penguin fans "loved" the hit Darius Kasparaitis laid on Eric "the Great" Lindros. To my knowledge, that is still considered a "clean" hit. If there were rules against hits to the head, that would be a different matter, but, also to my knowledge, besides high sticking, they do not currently exist--but I could be wrong. I come back to my original point. Both within the rules and based on Cooke's actions, his hit on Savard was "legal". However, yes, it was to Savard's head and he was obviously injured. Let us all hope there are no long term ramifications to him. What the real issue is is this. The league must overhaul its rules regarding what are and are not legal hits. As a part of that process, they must address how punishment is handed out. In other words, de-emphasize the weighting of previous conduct when determining punishment. I am referring specifically to the Richards hit on Booth. It was clear to most observes that Richards laid a vicious and uncalled for hit on Booth. Yet, the league in its infinite wisdom did not see fit to punish Richards beyond the referees kicking him out of the that game. This reevaluation must also include teaching the referees what the penalties are. Then, with this new understanding, they must be evaluated for their officiating including being reprimanded for their failure to make the proper calls. I laugh at the Philly fans I have to hear. All they talk about is how much of a pu$$y he is on and off the ice. I have said that Mike Richards is nothing but a really good checking forward and the whining was out of control after that. He is reviled league wide. I agree with all of that-- I was just saying that I imagine the majority of PENS fans would be absolutely outraged if Sid were to take such a hit, so I just find it a bit hypocritical for people to be defending Cooke for taking out the B's best player. And I certainly agree that the ambiguity and inconsistencies of the rules and their enforcement are a major problem.